You probably already know how much I love One Thimble. 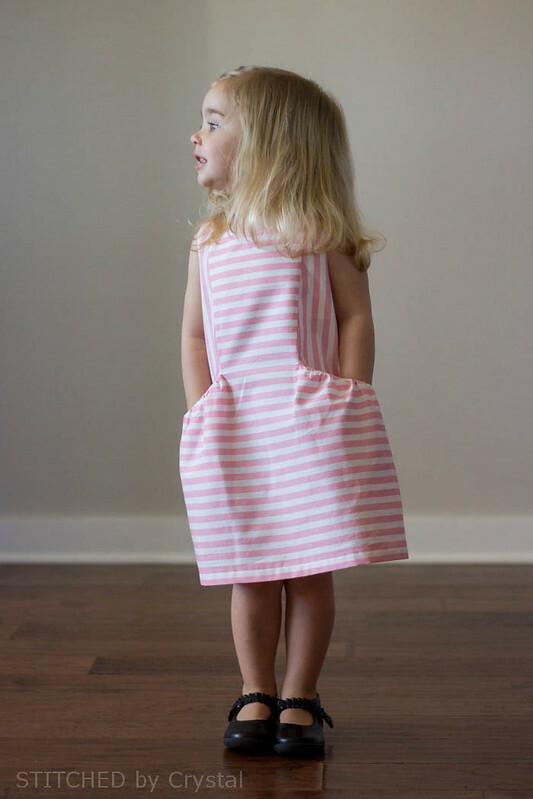 It is such a great sewing e-zine, I have been sewing up and sharing projects since issue 2 and last week the release issue 6! 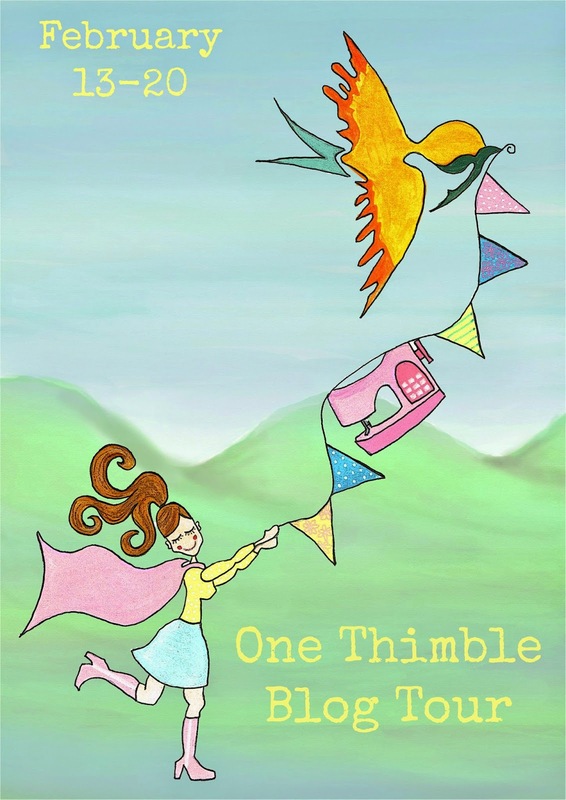 Today I am joining in on the One Thimble blog tour with Pattern Revolution. Just like the previous issues of One Thimble, issue 6 is chock full of PDF patterns and sewing related articles. Jen does such a great job of rounding up talented people to contribute patterns and articles. 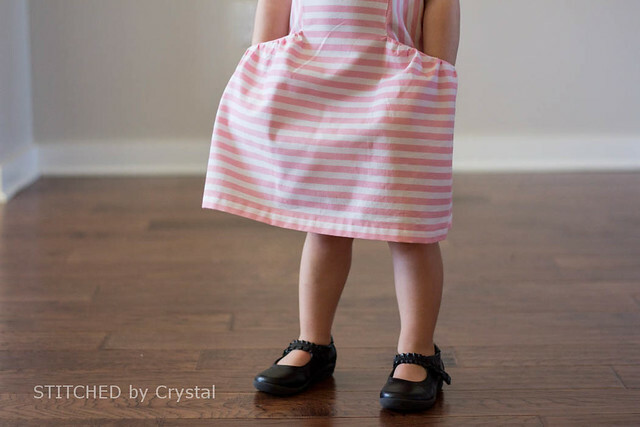 This issue has 10 PDF patterns, a couple dresses, a really adorable hat, a cardigan, a skirt, a bag, a multi-purpose apron, a boys (but could work for girls too) dress shirt, a cute fairy applique, and some fun little finger puppets. The One Thimble e-zines are so fun to read. I like to sit down with my tablet and flip through. There are great photos of all the patterns and tons of useful info in all the articles. 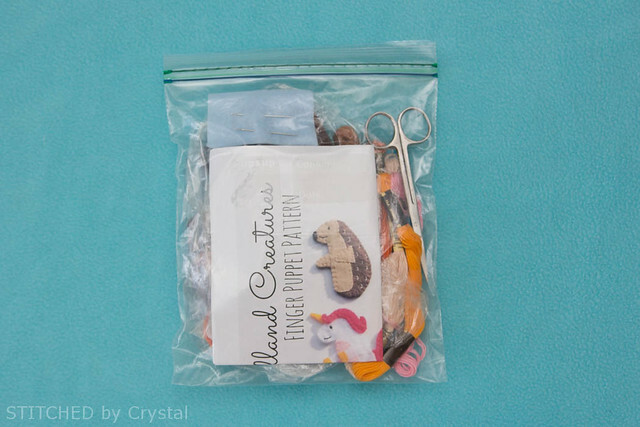 If you have a handmade business, or are think of starting one, this issue is for you! It has tips on increasing sales, branding your business, taking photos, writing item descriptions, and even for doing your book keeping. But even if you don't have a sewing business you will find plenty of helpful information in this issue. 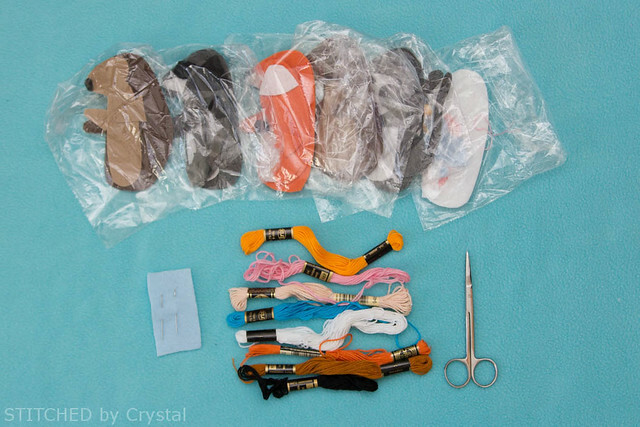 I was most excited to read the article on heirloom sewing, I have to try that soon! 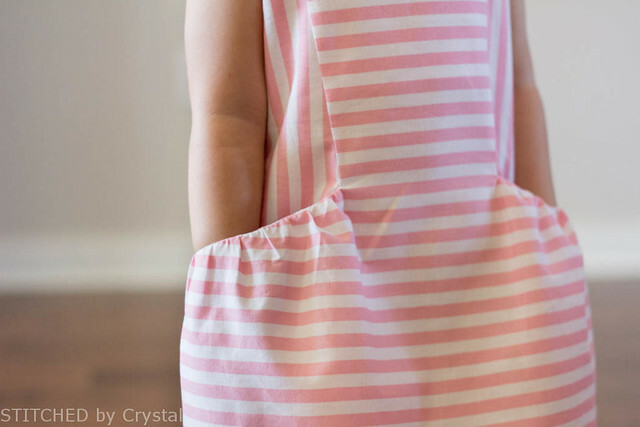 You can also read about adding zips, choosing interfacing, hemming knits, pleating, applique, and find a tutorial for making fitted sheets for your kids. OK, back to the patterns! 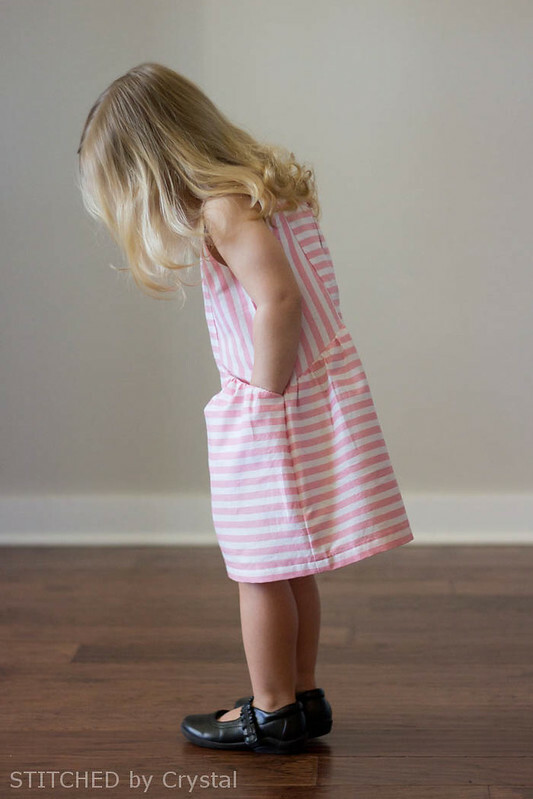 I sewed up two of the patterns from this issue, the Penny dress by Bubby and Me Creations and the Woodland Creatures felt finger puppets by Felt with Love. 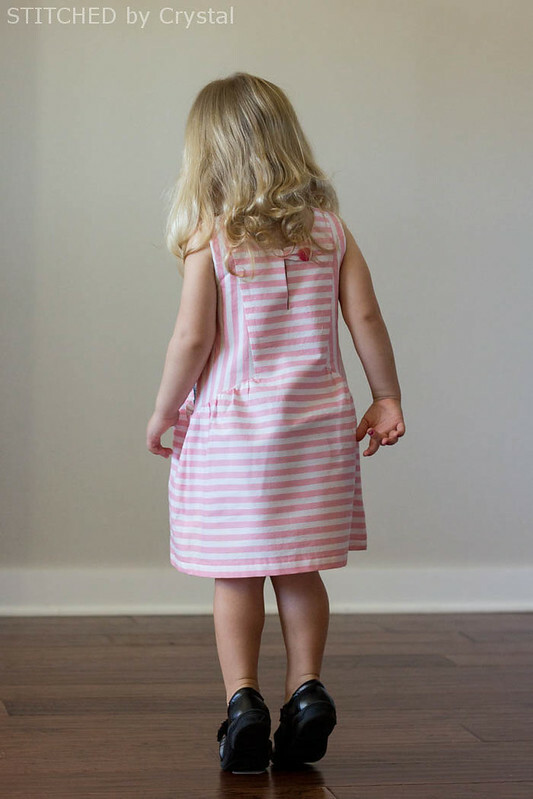 The Penny dress is an A line dress with some set in pockets in the front. 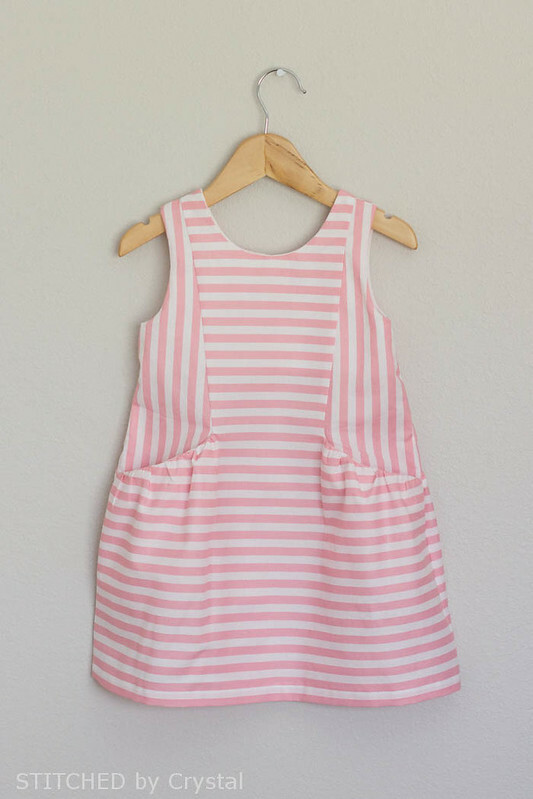 It has little ruffles on the sleeves, I cut those out but then decided to leave them off the dress, I liked the straight lines of the dress without the ruffle to go with this stripe fabric. 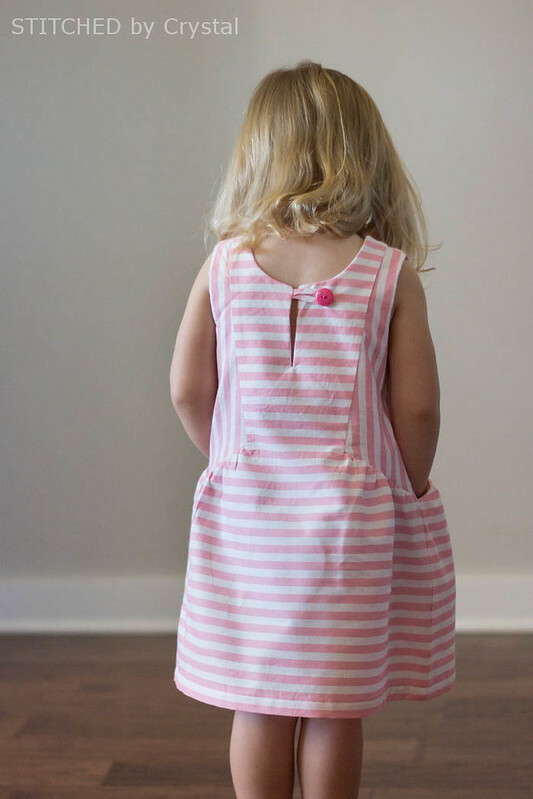 The slant of the pockets continues onto the back with some set in panels. 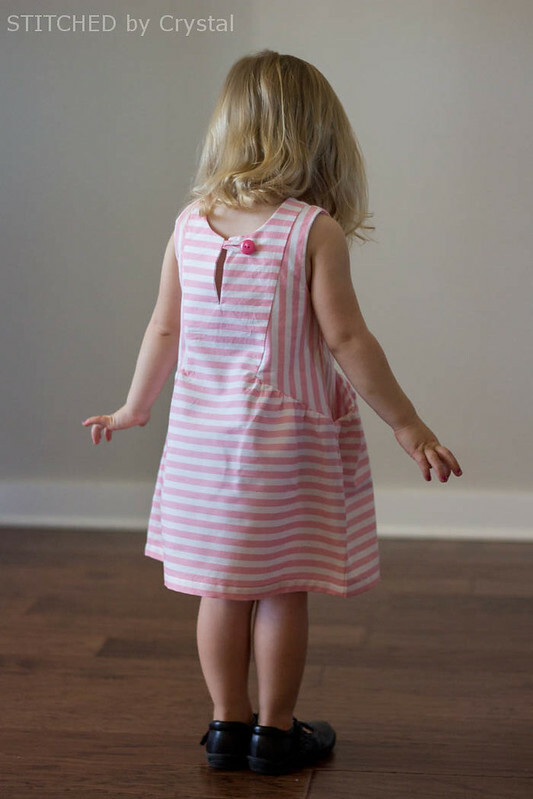 And the dress closes with a button and loop closure at the back. 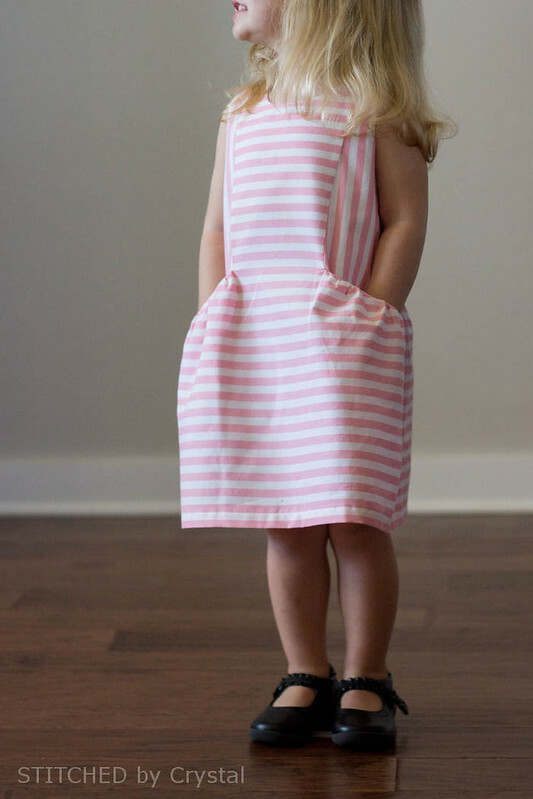 The Penny dress pattern is for sizes 1-10 (20"-28 3/8" chest sizes). 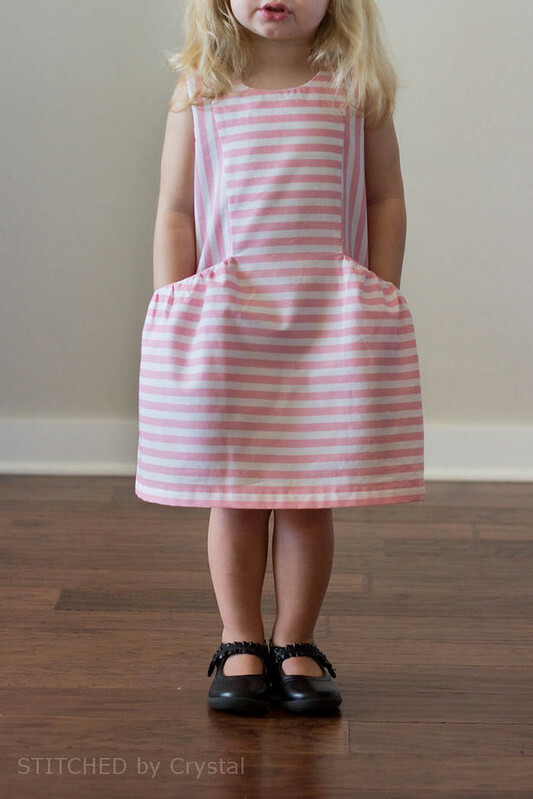 I sewed up a size 2 for Em, her chest size actually put her in a 1, but I wanted her to be able to wear it all summer, even if she grows a bit. The fit is perfect, with a bit of growing room just like I wanted. The pattern has 24 pages to print, that print in color. And the instructions are clear and easy to follow, with clear pictures for each step. The pattern is labeled advanced beginner. Those set in pockets might be a bit tricky for beginners, but once you get that first one figured out, the second is a piece of cake! 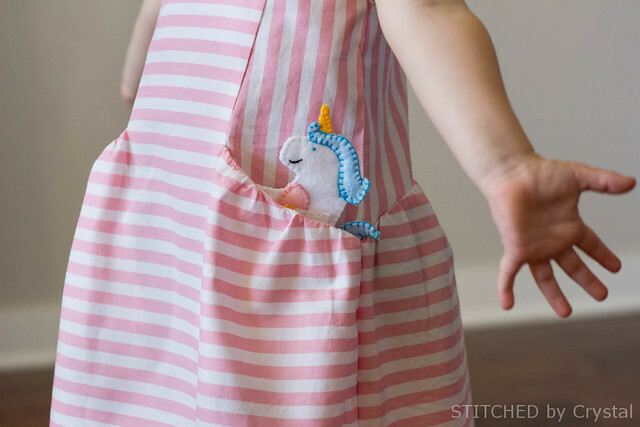 Those pockets on the Penny dress are nice and deep, perfect for storing your Woodland finger puppets! There are 6 different woodland creatures included in the puppet designs. Em loves these but will only play with the colorful unicorn and fox, she says the grey and brown ones are for boys. 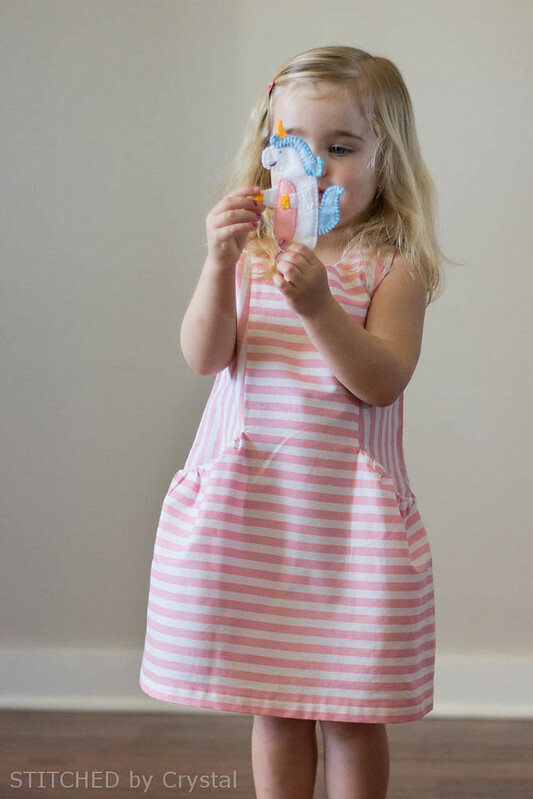 Looks like her brother will be getting those four puppets and I will be sewing them up again in pink and purple felt! 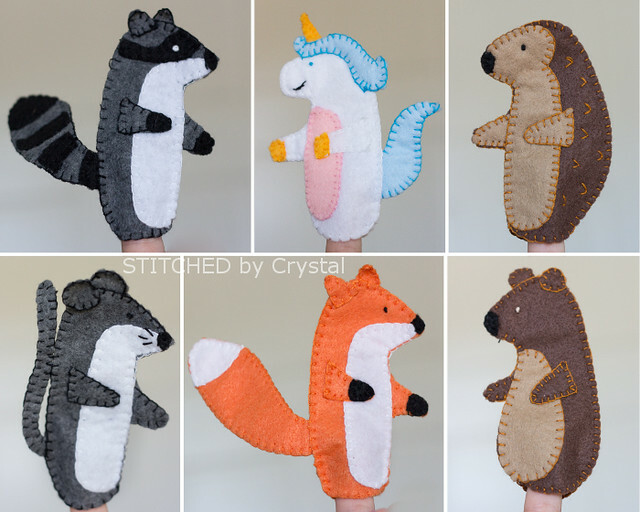 The puppets are really easy to sew up, but you do need some basic embroidery knowledge (there is also a short article with hand embroidery tips in the e-zine!) They take a bit of time to sew, I was excited to have some sewing I could do somewhere other than my sewing room. 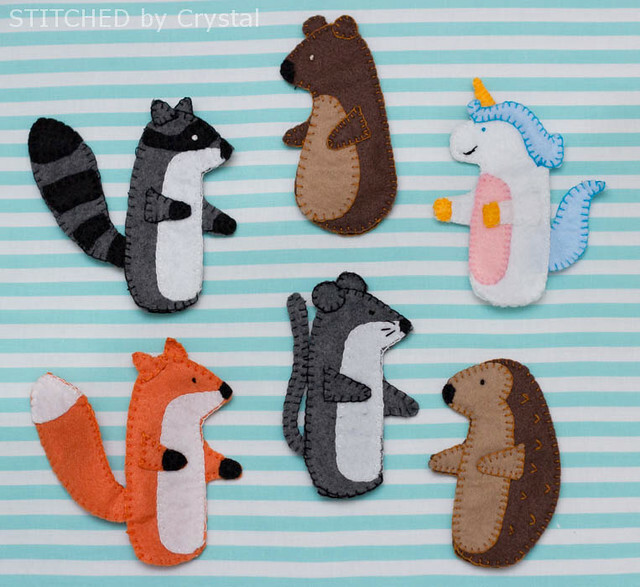 I cut out all of my felt one night and made a little puppet sewing kit for myself. I put all the pieces in bags, grabbed the embroidery thread I needed, some needles and small scissors and threw everything in a Ziploc bag that I could throw in my purse. Then I worked on the puppets whenever I had spare time, I did a lot of sewing while watching my kids play on the playground. 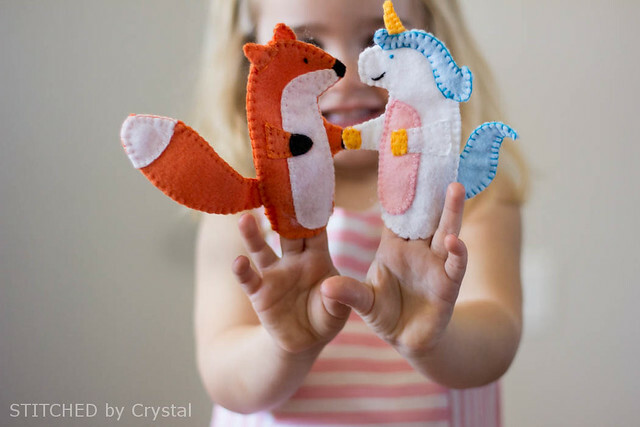 These puppets are great for imaginary play and make believe, I can't wait to see the puppet shows my kids put on with them! Want to get your hands on the e-zine? You can buy it over at One Thimble. And make sure you check out all the other stops on the blog tour! Can we use sewing machine threads if we don't have embroidery threads?